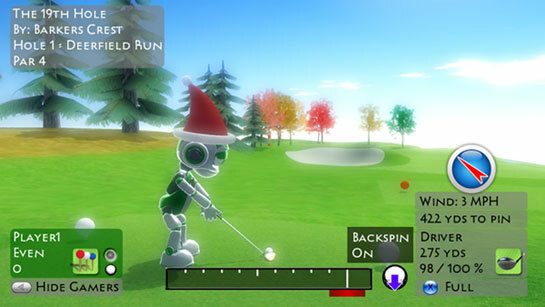 Play Easy Golf on December 24th or 25th and your robot will be wearing a cool little santa hat. The update is out there now so if you have previously downloaded Easy Golf follow the steps below to get the update. On your Xbox 360, navigate to the "My Xbox" section and find Easy Golf, just like you would if you were starting up the game for playing. When you are prompted with the choice to play or delete the game. Select delete. Don't worry, your saves will NOT be lost and you do NOT have to pay to download the game again. After the game is deleted, head over to the Community Games section of the XBL Marketplace. Find Easy Golf there and select it. The very first panel should give you the "Download Again" option. Select that option and the game will download again. When the download is complete you now have the updated version of Easy Golf. If for some reason you have already purchased Easy Golf and the "Download Again" option is not there or you are prompted to spend Microsoft Points, don't. Contact Microsoft support and they should be able to help you out. Happy Holidays from Team Barkers Crest! The Easy Golf update is almost here. As soon as it passes through peer review and is out on the marketplace the update will be available for download, and I'll post instructions on just how to do it. For now, I am revealing the 2 Christmas surprises I have promised along with a detailed list of the updates. The first Christmas surprise is a special Christmas gift from me to you. Upon download of the update you can look into your playable course list and see an extra course. The course is called "The 19th Hole" and I designed it specifically to take advantage of the new backspin feature of this update. If you've been waiting for a course to test your Easy Golf skills, this is the course for you. The other surprise will only show if you play the game on December 24th or 25th. Should I tell you what it is? ...hmm. Not right now. You'll just have to wait. Downloading other gamers courses for local play is now available. Click here to learn how. The creators gamertag automatically displays while playing a downloaded or shared course. Delete courses you don't like. Showing frames per second to see if your course renders slow. Place your golfball anywhere at anytime. This way you can practice shots from any location on your hole. Jump between design and preview quickly while working on that extra little bit of detail. In the course designer you can change the order of your holes. You can also change par for each hole. Add backspin to your shots from the fairway or teebox. ( Awesome ) You do this by pushing down on the right analog stick. You can preview your shot landing area by pressing up on the right analog stick while in swing setup. The golfball can now hit and bounce off of the flag stick. The golfball is now shadowed, which basically means if the golfball is in a shadow it is darkened a bit. The basic palm leaf's color is adjusted a bit to it's proper color. Somehow a bright green one slipped into the first version. Once you start the swing meter, you can cancel your swing by pressing ( B ) if you press it before setting the power. A few crash bugs have been fixed in the course designer. A few controller input bugs have been fixed in the menu screens. Trial experience has been modified to help people learn about the course designer. In any game mode once you get 10 or more shots you can quite the hole and move onto the next hole. Do this by pressing start to pull up the option screen. I've worked my tail off and put an enormous amount of hours into this update just for you guys because you all are the best. Hopefully we can build up a nice sized community of Easy Golfer so we can have a large list of courses to play. Anybody here remember n64.com? I do. I read it all of the time in college. Especially in my freshman year of '98. ( I'm getting old ) If you don't recall, n64.com was one of the many precursors to the now popular and highly respected IGN.com website. While I was typing away at my c++ programs in my entry level Computer Science classes, little did I know that one day a game I would make would appear in a featured article on my favorite video game website. Well, ok, maybe not the Nintendo IGN website. Easy Golf was reviewed in the Xbox.ign.com feature article XNA Communal Shower Volume 2...and it received a nice review. I couldn't be more excited! "Easy Golf may be a bit pricier than just about anything on XNA should be, but it also has more going for it than most Xbox Live Arcade games. What you get for your cash is a full arcade golf game, Xbox Live multiplayer, and a course editor that puts many games to shame. If you're crazy enough and have enough time on your hands, you could probably recreate your favorite local course and then play through it on Easy Golf. The golf isn't as tight as Tiger Woods and the graphics certainly aren't top notch, but Easy Golf is easily the most impressive of this batch. " Screenshots and videos on IGN...wow, look at how far things have come. Here are some more links for some Easy Golf reading enjoyment. "The course editor in Easy Golf is amazing. Honestly I don’t even like golf games very much, but I do like playing around with editing software." Eurogamer.net published a feature showcasing the community games worthy of your purchase. Easy Golf made its way in and I'm big time excited about it. They really liked the course editor and I'm glad they gave it a try. Click over to page 2 in the article to see what they say about Easy Golf, or just read below. "One of the most ambitious Community Games, Easy Golf sets out to offer more than just a basic golfing simulation. It's a multiplayer golf course construction kit, supporting up to four players online and offering the chance to show off your creations in real time. It comes with two pre-designed courses for those who just want to tee off, but the design element is so thorough and intuitive that there's no excuse not to come up with your own. The ball physics are rather rudimentary when compared to the more professional golf games out there but Easy Golf can certainly hold its own against Live Arcade's Golf: Tee It Up!" Oh, and while I have you here be sure to visit Easy Golf's forum on Xbox.com. It is a good place to meet people who are looking for online multiplayer matches or to just chat about course design. You can always get there by clicking "Forum" in the navigation menu of this website or click the link below. They are some cool people who are ready to play your course. Hope everyone had a nice Thanksgiving holiday or weekend. I took some pictures of the course I created, Barker's Revenge. I'm working on an update for Easy Golf that will allow you to download this course from me...or any course from anyone else. Pictures are taken with a digital camera from my TV so the quality isn't top notch but it gets the job done. Enjoy. Happy Thanksgiving holidays to everyone from Team Barkers Crest. I'll be on and off the xbox so keep your eye on my gamercard. If you see me online send me a message so we can get some online multiplayer going. "if you’re looking for a cheap, fully featured and highly polished golf game you can’t go far wrong." "It's a full blown editor which allows you to make exactly what the one guy who made this did. It's very robust with terrain formation and freeways and all you need for a golf course. It's got online play too. For 800 Points it's a pretty good deal." I try to email back everyone who emails me but a few times I've replied to a few folks and got back an "unknown email address error" response. So, if you haven't received an email back now you know why. The most important thing I want you to know is this. Send me pictures of courses you create so I can post them on the website. Don't worry if you think it is good or not just send it to me and I'll post it here to show off your fine effort. Also, this weekend I created a course called Barker's Revenge. I think it is awesome and every bit as good as the ones that came with the game. I'm looking for people to play it so if you see me online send me a message. My gamertag is Barkers Crest and you can always look at my gamertag here on the website to see my online status. Wow, I can't believe you made it this far. First I'd like to say thank you for taking interest in Barkers Crest Studio and Easy Golf. I've got a lot of big plans for this website. For now, head on over to the Easy Golf page to watch the trailer and see screenshots. It is a heck of a game for less than the price of two starbuck coffees or a trip to the movies. I'm very proud of it and put a lot of time, effort, and personal sacrifice into it. I hope everyone else enjoys it at least 1/10 as much as I do. Create your course and create as many holes as you would like up to nine holes per course. Then, if you have an Xbox Live Gold Account select Xbox Live Multiplayer on the title screen. Then select Host on the next screen. Nothing is more cool than seeing your friends golf balls fly around on your created course in real time. One of my favorite things to do is re-create my favorite holes from the local golf courses I play. As a matter of fact, the 9th hole on the Hazard County course is one of my most favorite. I know the website is a bit empty in functionality for now but there is a lot planned and being developed by our 1 man team. Posted Games: That little section you see to the right is where you'll see posted games. What are posted game? Good question. I'll be adding in some functionality where everyone will have their own personal account with the website. That way when someone is planning on playing Live Multiplayer match they can post what day and time they plan on doing it so others like you and me can hop on at the same time and join their play session. I'll be posting there quite a bit so you'll know when you can jump on and play me. Video Tutorials: This is pretty self explanatory. I'll be working on some video tutorials so you can get the most out of your Easy Golf experience. There are some cool tips and tricks I can share to make your design experience AAA. User Content: That is right. I want you to take pictures or videos of courses you create and send them to me. I'll post it here on the website for everyone to see. Send them immediately to matt.davis@barkerscrest.com . XNA Developer Tutorials: Once things settle down I'll start posting tutorials for people who are interested in making XNA games. They'll be intermediate to advanced level because there are plenty of beginner resources already out there. If you are a beginner and interested in creating community games, visit creators.xna.com . Well, that is all for now. Thank you for reading and I highly advise you to give Easy Golf a try if you haven't already. If you have any questions, comments, or want to report a bug just send me an email.